Over the next few months we’ll be running a series of posts featuring the digitised items in the Ephemera collections of Sir George Grey Special Collections, specifically focussing on the Old Colonists’ Museum (OCM) Ephemera Collection. The Old Colonists’ Museum was opened by Mayor J.H. Gunson on the 22 March, 1916 and was located in the same building as the Auckland Public Library and the Auckland Art Gallery. Ref: James D. Richardson, Looking east from Lorne Street showing Auckland Public Library, c1903, Sir George Grey Special Collections, Auckland Libraries, 4-2416. It occupied two large rooms on the top floor of the building and contained, “a collection of pictures, maps, prints, documents (printed and manuscript), and objects illustrating the history and development of New Zealand, especially the Auckland Province and City.” This quote is from OCM founder and director John Barr’s 1922 history of the three institutions, of which he was in charge until his retirement in 1952. Barr also states in this history that “the Museum owes its origin chiefly to the suggestion of Messrs. [Thomson Wilson] Leys and [Henry] Shaw, who were impressed with the Early Settlers’ Museum, Dunedin”. So what was the OCM filled with? In addition to the types of items shown in this post it included: large oil paintings by Gottfried Lindauer, the first wooden plough used in New Zealand, a bowl that belonged to Captain James Cook, and an armchair that was used to lower “Mrs. John King… from the brig Active on the occasion of the Rev. Samuel Marsden’s first visit to Oihi, Bay of Islands, on December 22, 1814.” (New Zealand journal of agriculture, 15 February 1951). Here is an example of a bill of fare from our collection showing, unfortunately, no oysters on the menu when Governor Grey visited Southland. Perhaps the beds had already been depleted by then? 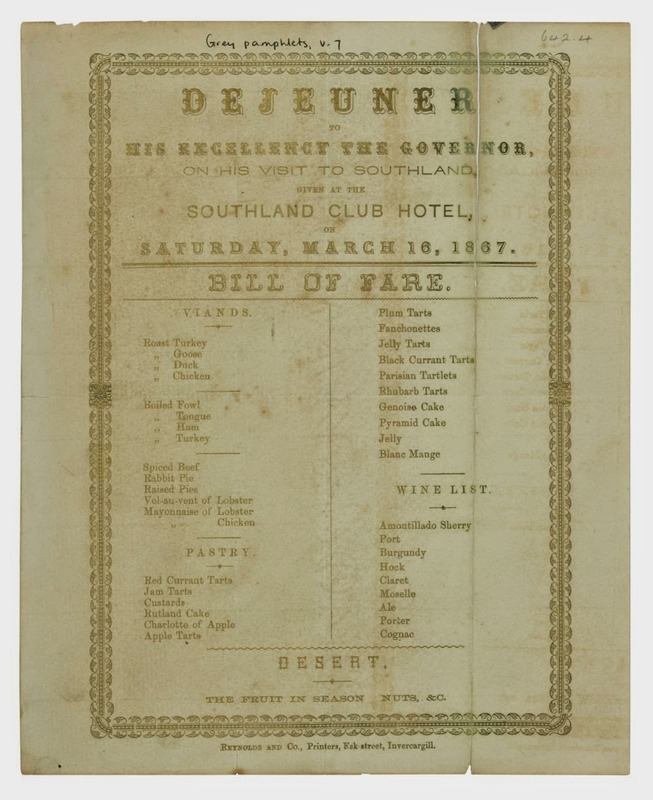 Ref: OCM Ephemera - 'Dejeuner to His Excellency The Governor on his visit to Southland', 16 March 1867, Sir George Grey Special Collections, Auckland Libraries. 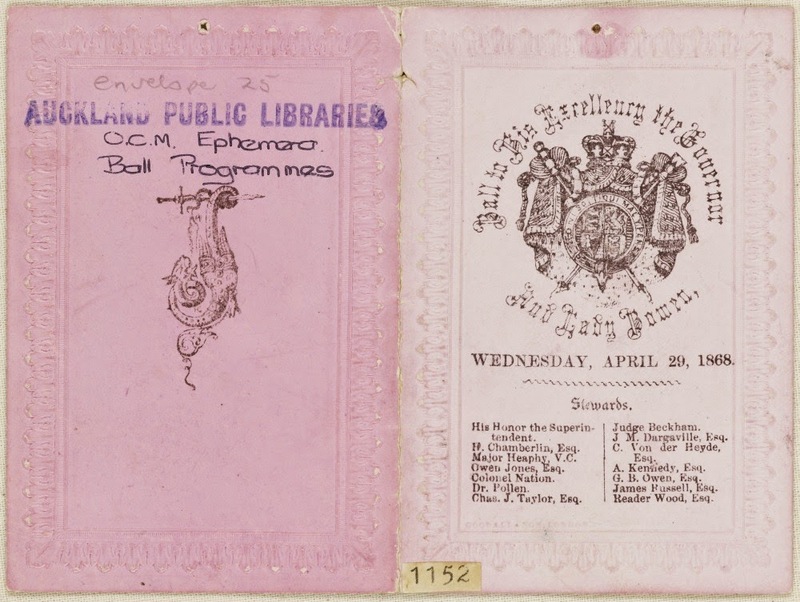 Ref: OCM Ephemera - A flyer with poems by W R Wills, commemorating the opening of the Auckland Public Library and City Art Gallery, 8 June 1885, Sir George Grey Special Collections, Auckland Libraries. Ref: Excerpt from Auckland Star, Volume LXV, Issue 55, 6 March 1934, p.6. Late in 1956 the council decided to close the OCM and offer its contents to the Auckland War Memorial Museum, with some exceptions. “Such items as maps, manuscripts, charts, literary documents and the like, were to remain with the Auckland Public Library for incorporation in to the reference department. And the Auckland City Art Gallery was to have such of the works of art as its director, Peter Tomory, wanted.” Thus we have the beginnings of what is now the OCM Ephemera Collection in the Sir George Grey Special Collections at Auckland Libraries. 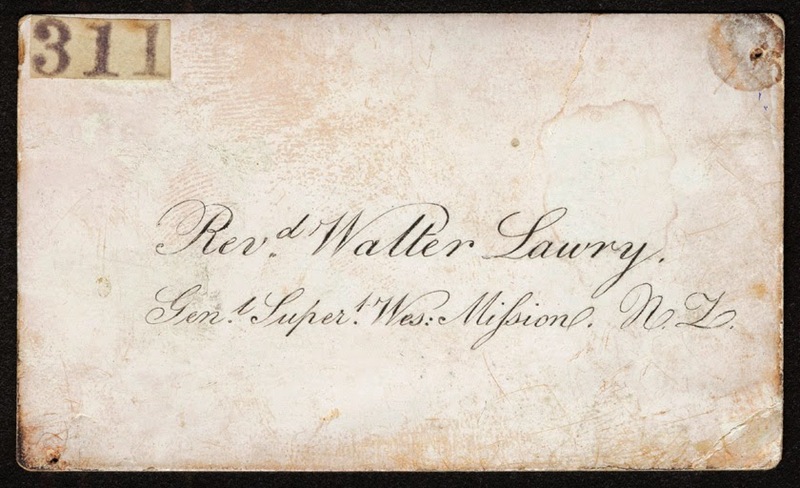 Ref: OCM Ephemera - Reverend Walter Lawry, General Superintendent, Wesleyan Mission, New Zealand (visiting card), c mid 1800s, Sir George Grey Special Collections, Auckland Libraries. 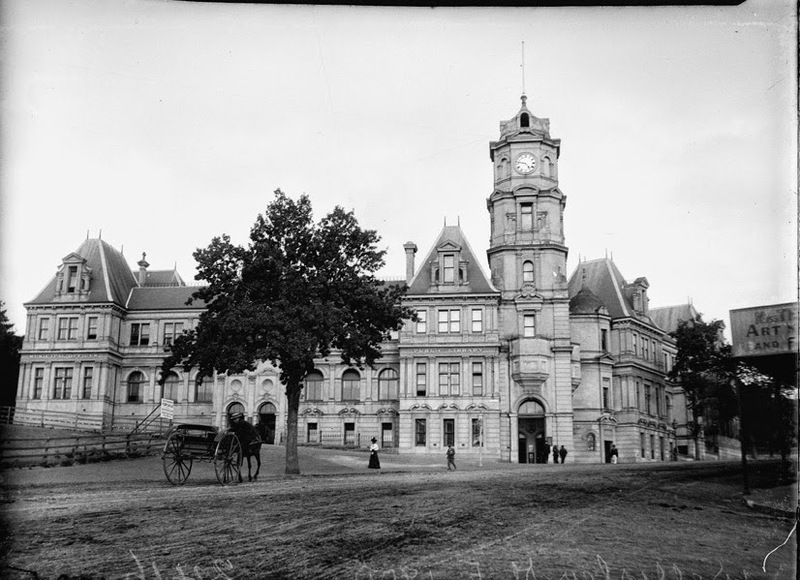 This meant that council decided to store the objects that had been offered to the War Memorial Museum under the stage at the Auckland Town Hall, where they remained for 9 years. In 1966 the objects were accepted and included in the permanent exhibition at the Museum called, “Centennial Street”. Whilst doing some reading about the OCM I found a fascinating clipping in one of the New Zealand Scrapbooks about a supposed medal of Charles Heaphy’s from the New Zealand Wars. The article states that the medal was found in “a box of trinkets” and that Mr. Peter Holmes who found it intended on presenting it to the War Memorial Museum as they already held Major Heaphy’s Victoria Cross. 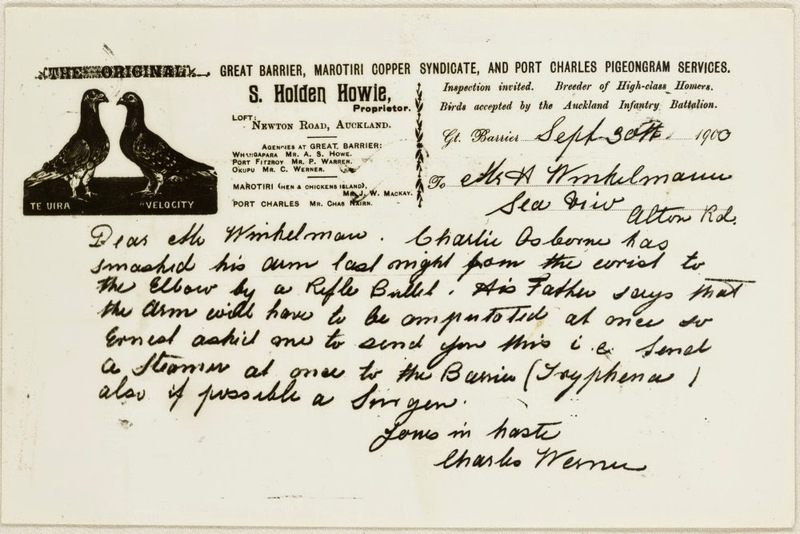 Ref: OCM Ephemera - 'Ball to His Excellency the Governor and Lady Bowen', 29 April 1868, Sir George Grey Special Collections, Auckland Libraries. Ref: OCM Ephemera - Pigeongram sent to Henry Winkelmann, Sea View, Alton Road. From Charles Werner on Great Barrier Island, 30 September 1900, Sir George Grey Special Collections, Auckland Libraries. Do check back over the next few months to see more wonderful items from the Old Colonists’ Museum Ephemera Collection. 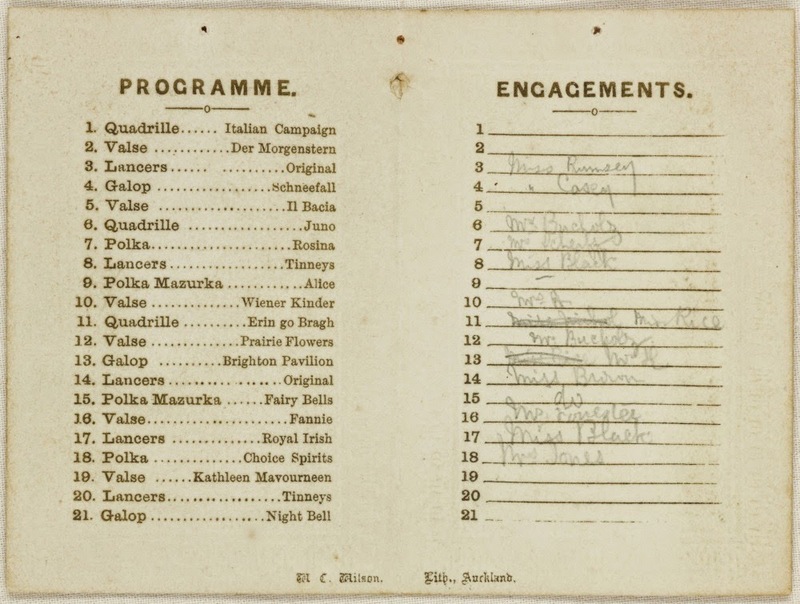 In the meantime you can search for ephemera via the Ephemera Index (using the keywords ‘old colonists’ museum’ for the digitised OCM materials) and read more about some of our opera ephemera here. Auckland Scrapbooks and New Zealand Scrapbooks. 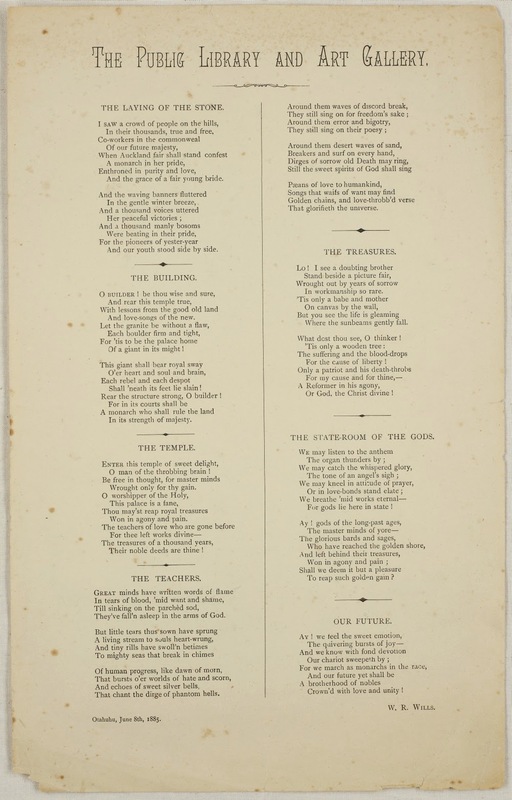 The scrapbooks have been compiled mainly from the "Auckland Star" and "New Zealand Herald". Useful articles were pasted into these scrapbooks, including Auckland or New Zealand history or obituaries, and these were also indexed into the New Zealand Card Index, which is now housed in the Auckland Research Centre at Auckland City Libraries. These are searchable online via the NZ Card Index as well as Index Auckland.